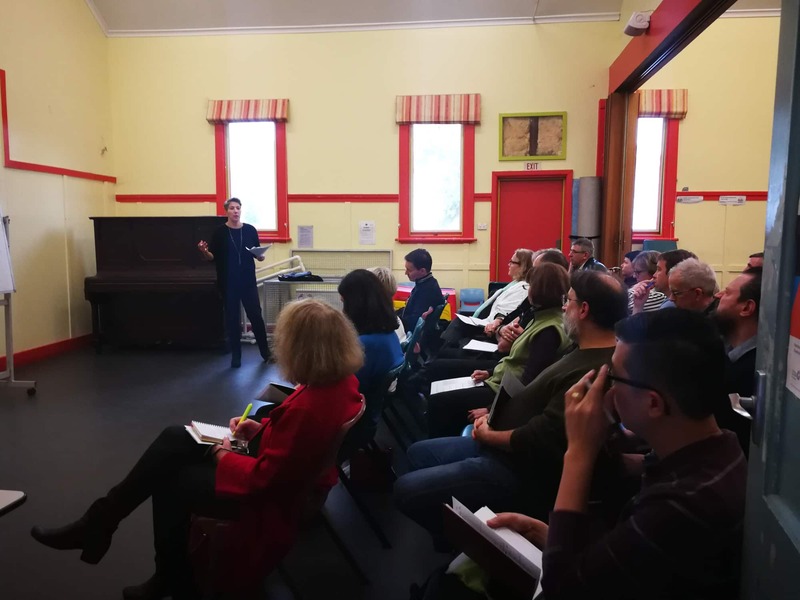 MELBOURE—With enormous local interest in navigating the labyrinth of U.S. taxes from abroad, Democrats Abroad Australia’s Victoria (DAA-VIC) chapter was pleased to host a tax seminar Sunday evening with university lecturer and U.S. tax attorney, Karen Powell. A graduate of Stanford Law School, Ms. Powell has extensive experience in tax matters ranging from federal and state courts to regulatory tax matters, and nowadays exercises her tax expertise in academia. Karen Powell explaining a complicated aspect of expat taxation. 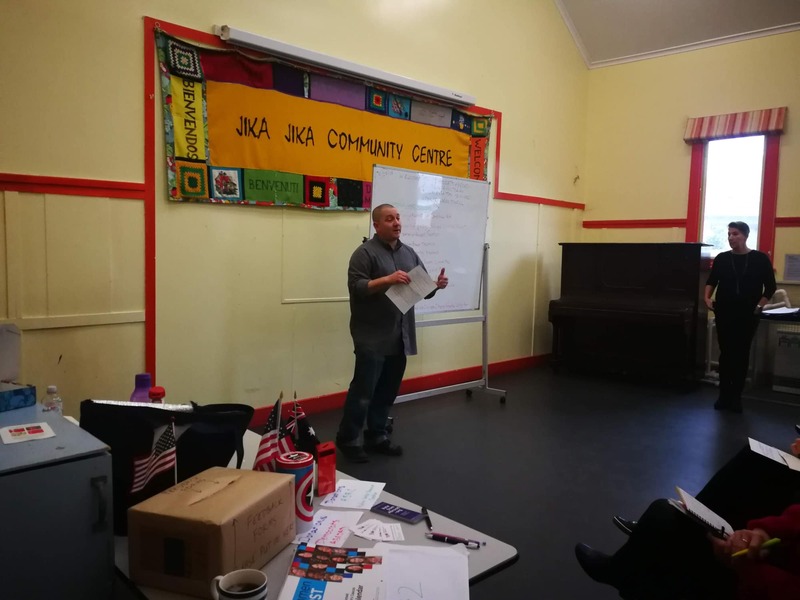 Held at the Jika Jika Community Centre in Northcote, Sunday’s event drew over fifty attendees. Topics covered by Ms. Powell included the basics of understanding taxes, the historical perspective of U.S. taxation, the tax implications of dual U.S.-Australian citizens who file in both countries with the Internal Revenue Service and the Australian Taxation Office, the tax differences on the state level between the U.S. and Australia, the Report of Foreign Bank and Financial Accounts (commonly known as FBAR), the Foreign Account Tax Compliance Act (FATCA), and how individuals should calculate the risks involved in deciding to not comply with U.S. tax obligations. Many US citizens living abroad have difficult taxation situations, only made more difficult by a complicated system. Ms. Powell also touched on the impact of the updated tax code for American small business owners. In its haste to include Territorial Taxation for Corporations in the Tax Cuts and Jobs Act passed in 2017, Congress created two new “transition taxes” known as the Repatriation Tax and the Global Intangible Low-Tax Income (GILTI) Tax. While the likes of Google and Apple are able to sustain such revenue hits after hoarding billions of profits in overseas subsidiaries, American small business owners abroad are scrambling in fear over how to comply with the new law while surviving financially. Despite extensive lobbying from Democrats Abroad and other pro-expat interest groups, the GOP-led Congress chose to neglect fairer tax reforms for the estimated 9 million Americans living abroad. Michael Ramos, DA Taxation Task Force member, telling attendees what they can do to support fair taxation. American citizens residing overseas hold a unique view on U.S. taxation. With the expat perspective in mind, Democrats Abroad has taken several actions to inform members of Congress of the unintended consequences of the FATCA, the damage caused by the recently-passed “transition taxes” creation, the urgent need to switch from the current practice of citizenship-based taxation to residence-based taxation, among numerous other tax initiatives. Following on the success of the last year’s “Resistance Summer” campaign, the Democratic Party has unveiled its new “A Better Deal” campaign to fight the Trump-Republican agenda. The Democratic proposal includes rolling back the enormous GOP tax breaks and special-interest loopholes for the richest one percent, and instead invests that money in America’s teachers and other essential jobs. The current push for tax reform for Americans abroad is consistent with A Better Deal, and Democrats Abroad will continue to fight for a level playing field for tax fairness of U.S. citizens around the globe. 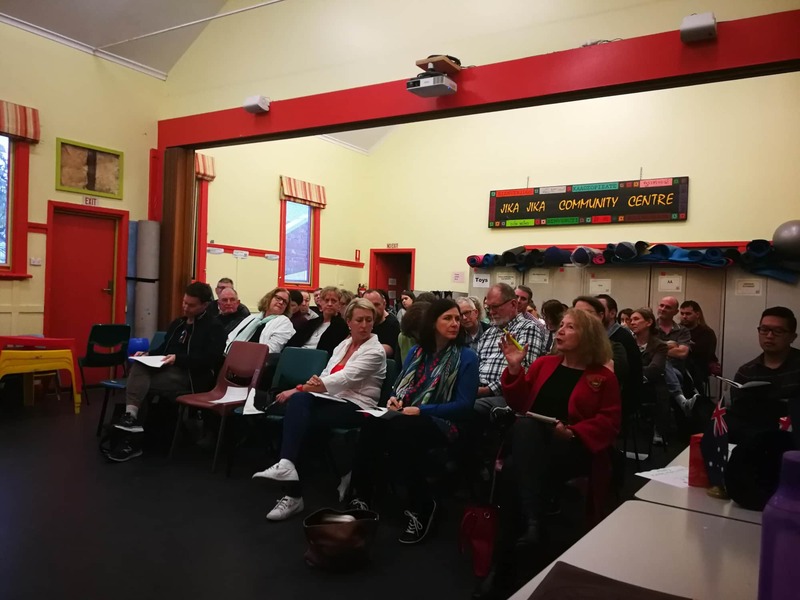 Yesterday’s tax seminar with Ms. Powell coincides with Democrats Abroad’s full representative body passing a resolution in support of abolishing citizenship-based taxation and moving to the more fairer residence-based taxation. The resolution also urges the Democratic National Committee to formally recognize the serious tax issues Americans abroad face, and calls on Congress to take action to rectify the current practice of unfair expat taxation. Although Sunday’s tax seminar was not video-recorded out of respect for privacy requests, DAA-VIC members can still review essential expat tax information from a Democrats Abroad-held webinar from 2017 by clicking here. To learn more about Democrats Abroad’s tax advocacy efforts, or if you would like to sign up to receive e-mail updates from the DA Taxation Task Force, please click here. DAA-VIC Vice Chair Marybeth Yarosh contributed to this article. MELBOURE—With Texas and Illinois being only weeks away from holding the first primaries, this past weekend Victorian members of Democrats Abroad Australia (DAA) began the election season with one goal in mind: Democrats re-taking control of Congress. The Republican leadership of the current Congress has proven to be deeply unpopular, and the recently-passed Republican Tax Scam has only added fuel to the already-raging fire burning within Americans across the globe. Meeting at the Pg.2 cafe in Richmond, DAA-Victoria members pounced on the momentum of recent Democratic victories on the state and federal level, and enthusiastically gathered to discuss several items to “take back Congress.” The agenda focused primarily on getting-out-the-vote (GOTV) efforts. “Make no mistake, we’re in full campaign mode,” said DAA-Victoria Chair Thomas Lopez. “The time to ramp up efforts for overseas Americans with voter registration, in addition to pounding the phones with reminders for DA members to vote, starts right now.” Indeed, DAA members in Victoria are absentee voters from almost every state and the chair’s emphasis on reaching out to these voters had the unanimous backing of the members present. Chair Thomas Lopez begins reviewing the agenda of the day. A remarkable amount of volunteerism was seen at the chapter’s GOTV meeting. Chris Stueckle, the former DAA national secretary with formal U.S. election officer training, offered her assistance to any member with absentee voting questions. New member Chelsea Deng contributed heavily to the discussion and indicated interest in helping the leadership with its online presence. With letters-to-the-editor already published, Kenn Feldman committed to continuing his efforts to get the Democratic message in print media. 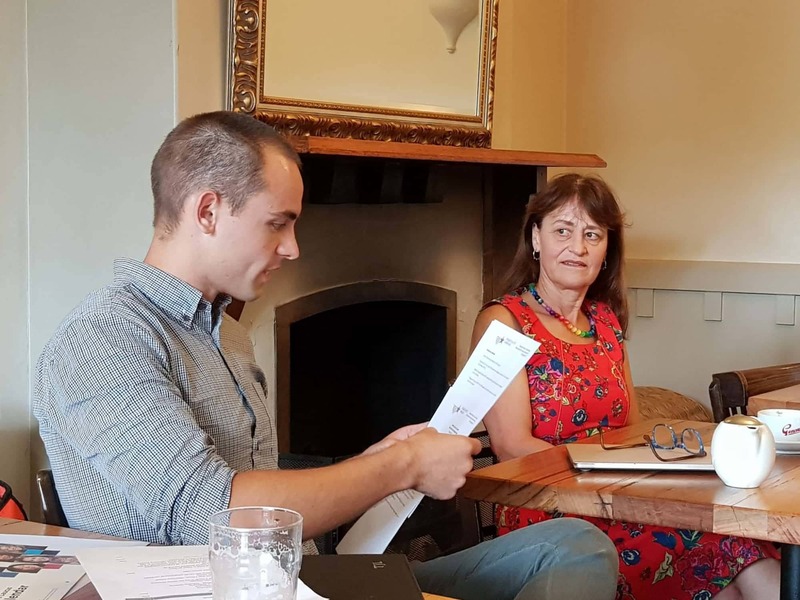 A motion by former DAA national vice chair Dr. Ersie Burke to increase chapter efforts to meet with members in regional Victoria was seconded by Liz Maasen. A regional chapter meeting in the northern part of the state is likely on the horizon for the weekend before the Easter holiday. Once confirmed, details of the event will be made available on the DAA website, DAA-Victoria Facebook group, and via e-mail to all members from Chair Lopez. Americans abroad to request their ballots. His “progressive talk” podcast can be heard at the 00:07:35 mark here. Moreover, members were reminded to keep an eye out for attempts to fire or undermine the Trump-Russia investigative efforts of the U.S. Department of Justice Special Counsel Robert Mueller. If Mueller is fired because of “politics” and not, say, professional misbehavior, Democrats Abroad has called for the House of Representatives to begin impeachment hearings immediately. As a reminder from DA’s international executive committee, all members are discouraged from protesting or demonstrating directly in front U.S. embassies and consulates – under the name of Democrats Abroad – in the possible event of a Mueller firing. Instead, all members are strongly urged to contact their elected congressional officials demanding action. The “Take Back Congress” initiative is the chapter’s highest priority for the time being; however, DAA-Victoria members should not neglect to vote in state and local races whenever possible. A list of key electoral dates for all members to review can be viewed here. 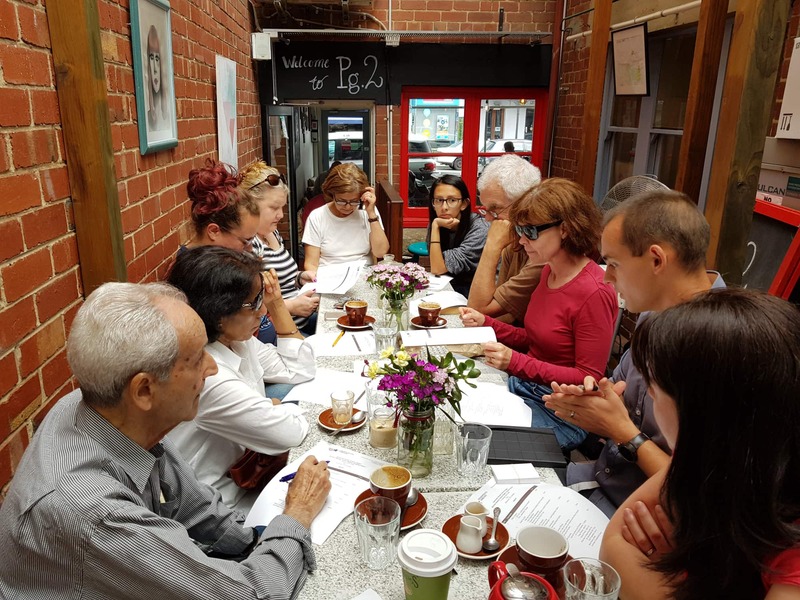 For the next Melbourne-based chapter meeting, members are encouraged to submit ideas for a new meeting venue. 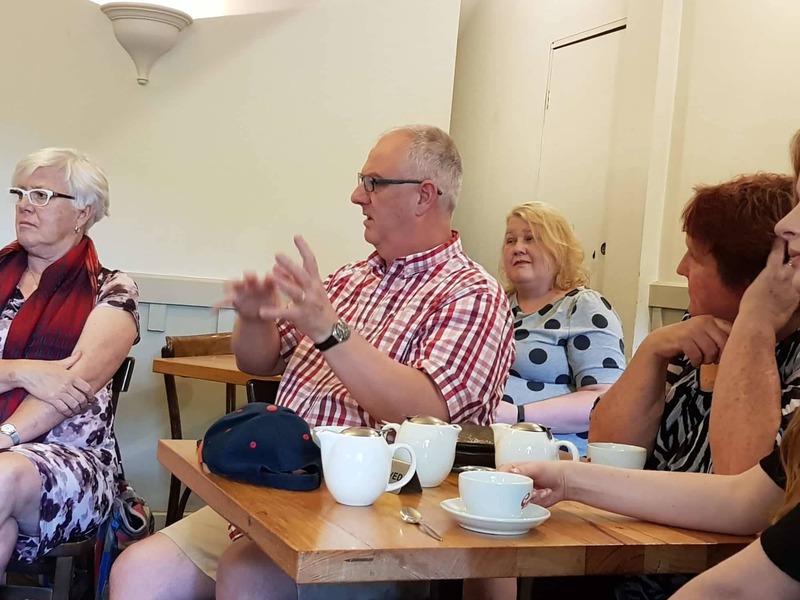 Any location recommendation should consider a reasonably quiet space for member discussion, an ideally wheelchair-accessible venue, and preferably a site with little to no cost associated with using it. Vice-chair Yarosh contributed to this article. MELBOURE—One year ago, the day after the presidential inauguration of Donald Trump, record numbers of protesters hit the streets of every country around the globe to demand long-overdue fair and equal treatment of women in society. In Washington, D.C. alone, it was estimated that the 2017 Women’s March was the largest protest demonstration in recorded U.S. history. Since then, the movement has only grown in intensity and drive. Amplified by the voices of millions of women who have come out publicly, sharing their experiences and demanding action from a nation that finally started listening. Despite these calls for gender equality, the White House and Republican lawmakers have – shockingly – rejected the American people’s overwhelming call for pro-women and pro-equality reforms. As a result, yesterday in the highly-visible downtown area of Melbourne, members of Democrats Abroad Australia-Victoria (DAA-Vic.) joined with other Melburnians, union members, environmentalists, and other women activists to reiterate the message that overseas Americans refuse to be silenced on issues affecting women. With chants booming through streets, the scene from Alexandra Gardens to Flinders Street Station was an impressive one. Among the vocal demonstrators were some expatriate Americans clearly dissatisfied with arguably the most anti-women’s rights president and Congress of the modern era. Participants of the second Global Women’s March called for a halt in ongoing sexual harassment, the need to respect the lifestyle of those identifying as LGBT women, a review of policies seen as biased against women, and an encouraging message for increased female candidates to all elected office positions. DAA-Vic. member Melissa Goffin was a lead organizer of the Melbourne event. Major news outlets such as The Age, SBS, and The Guardian all took notice of Goffin’s dedicated involvement. Goffin and other organizers received additional planning assistance coming from fellow DAA-Vic. members Anne Webb and Brigette Relyea. 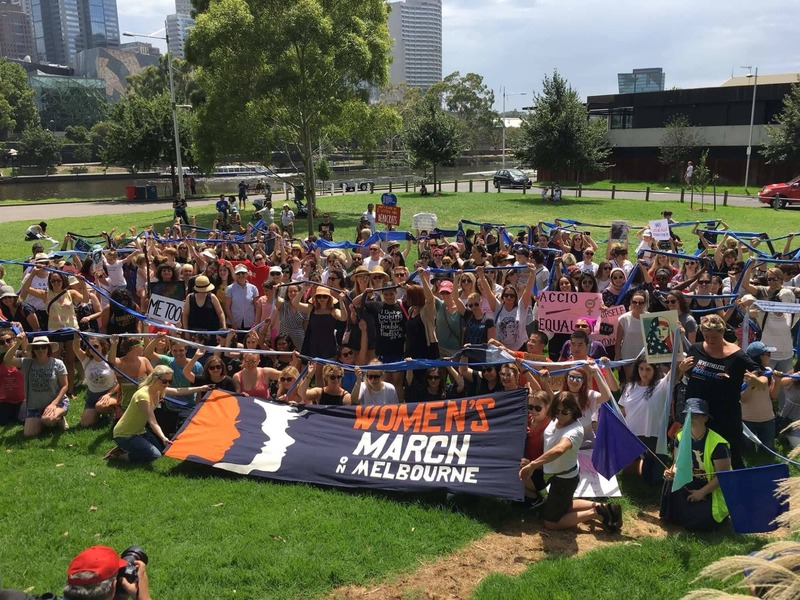 Reports of the 2018 Women’s March in Melbourne range from 500 to 1,000, although these numbers are disputed by those who were in attendance. They argue the number was likely closer to 2,000 participants. As 2018 is an election year in the United States, all DAA-Vic. members are reminded to immediately request ballots for all 2018 elections in which you are eligible to vote. Chair Lopez also announced that the next meeting of the Victoria Chapter will be announced within days after confirmation of venue location, date, and time. Items expected to be discussed include details on the chapter’s upcoming efforts for getting out the vote, or GOTV, in addition to notifying members of recent DA leadership changes. MELBOURNE—In a rare opportunity for Americans living overseas to hear directly from a congressional candidate challenging an incumbent, the Victorian chapter of Democrats Abroad Australia (DAA) earlier tonight hosted Brian Forde, a Democratic candidate running for the U.S. House of Representatives in California’s 45th Congressional District for an hour-long discussion on several hot-topic issues. Less than an hour’s drive southeast of Los Angeles, the 45th District includes the Irvine, Tustin, and Mission Viejo urban centers along with several other notable Orange County communities. Forde, a former senior White House official specializing in telecommunications and technology issues, is one of a handful of Democrats running in 2018 to oust the Republican incumbent, Rep. Mimi Walters. Mr. Forde joined DAA-Victoria during his visit to Australia. The DAA-Victoria Chair, Thomas Lopez, welcomed Forde to Melbourne and offered gratitude for taking time out of his busy schedule to meet with local Democrats. Other members also expressed appreciation for Forde’s willingness to learn more about the concerns of Americans living abroad. After the meeting, Chair Lopez offered his thoughts. “Brian is a formidable congressional candidate. He certainly brings a unique perspective to the race from his time in the White House and living in different countries, not to mention his business-related experience. We were fortunate to have Brian willing to speak to us especially since congressional candidates don’t often take time away from their busy campaigns to speak to their overseas constituents. I’m confident that our members in Victoria who vote in California’s 45th District will consider Brian’s and other candidates’ credentials and vote accordingly,” Lopez stated. According to the Election Assistance Commission, the state of California led the nation in voting by mail in 2016, with absentee ballots representing more than 50 percent of the total ballots cast there. CA-45’s incumbent, Rep. Walters, most recently won re-election but district voters favored Hillary Clinton over Donald Trump. Rep. Walters has also battled ethics inquiries in the past during her time in the state legislature, and since her time in Congress has received petitions calling for her to hold in-person town halls with constituents. Her voting record has been closely watched and has received even more scrutiny after her unpopular May vote to repeal the Affordable Care Act. Many political experts and observers view this seat as completely “flippable” in Democrats taking back the House of Representatives if voter outreach and resources are readily made available. Indeed, Democrats have targeted Walters’ seat and intend on hammering the congresswoman for her pro-Trump agenda voting record. As California’s election primary is still several months away, as a standard policy, Democrats Abroad does not endorse any candidate when there is more than one Democrat running in the same race for any U.S.-based elected office as per its by-laws, thereby giving every Democratic candidate an equal opportunity to campaign on a level playing field. FOR INFORMATIONAL PURPOSES ONLY: To learn more about Brian Forde and his campaign, see here. 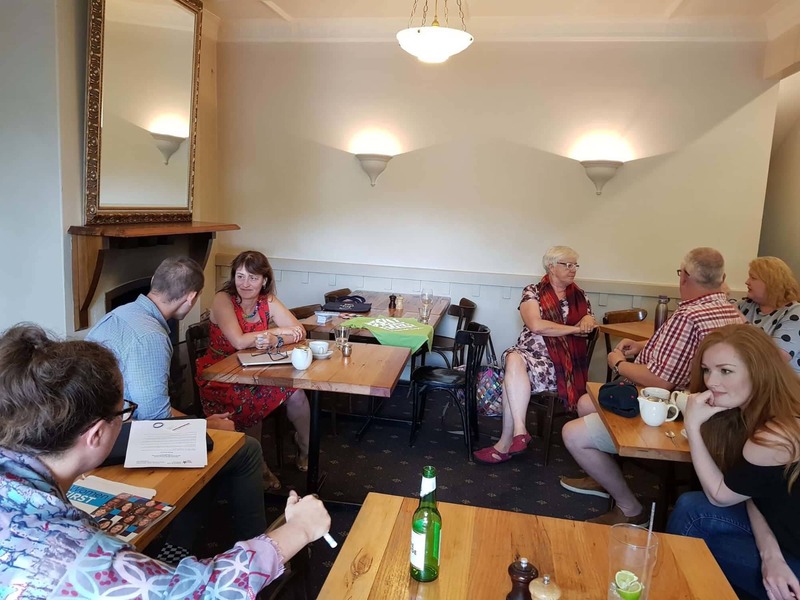 GEELONG—In a room consisting of Americans from the Geelong and Melbourne areas, Democrats Abroad Australia’s (DAA) Victoria chapter heard from several members on matters ranging from expatriate taxation to registering voters on college campuses to congressional hearings. A larger-than-expected turnout led to higher participation among members in soliciting ideas and volunteering for chapter initiatives. The Chair of DAA-Victoria, Thomas Lopez, opened the meeting with a discussion on why he and others remain involved with U.S. politics while living thousands of miles away from the homeland. Responses included reasons such as regaining America’s reputation lost to President Trump’s ill-advised policies, reforming the U.S. tax code to improve the financial well-being of Americans abroad, and several other reasons cited. The dialogue then evolved to a reminder for members who vote in Virginia, Utah, Alabama, or New Jersey to cast their ballot in upcoming special elections. Meanwhile, the Republican majorities in the U.S. Senate and House of Representatives appear to be on edge stemming from their controversial votes supporting the repeal and replacement of the highly popular Affordable Care Act. As Democrats move forward in spreading a populist message on improving American policies, Republicans in Congress are scrambling in disarray and showing vulnerability in leading up to Election Day in November 2018. Only 24 House seats need to be flipped from red to blue in preserving a Democratic majority and thus halt the misaligned Trump agenda. Chair, Thomas Lopez, explaining the Victoria Chapter's strategy for increasing and engaging membership. Heading the DAA-Victoria task force on voter registration, Melburnian Marybeth Yarosh brainstormed several suggestions in getting local college students from the U.S. registered to vote and participate in DAA activities. With several ideas worth pursuing, members interested in assisting with the Task Force should contact the chapter’s Chair. Lopez also reiterated the importance of Democratic get-out-the-vote (GOTV) efforts in 2018 in the chapter’s “take back Congress” goal heading into the mid-terms. Lopez hinted at a surprise special guest speaker at a chapter meeting shortly. The membership was reminded to save November 13th on their calendar as a potential meeting in Melbourne’s CBD area upon confirming details. 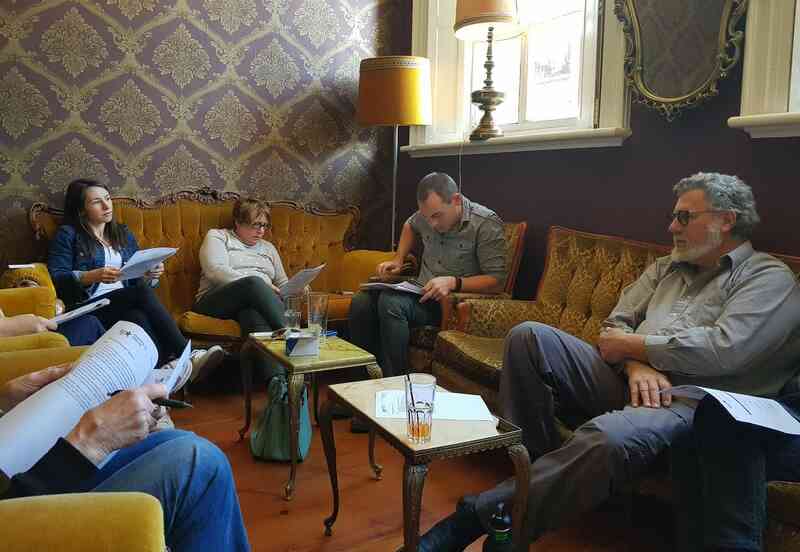 With the American winter season inching closer, DAA members in Victoria approaching summer are scorching hot and motivated to take action and continue growing its membership.